As a friend from one West African country was claiming that Sierra Leone is the poorest country in the world, a Tanzanian journalist in Beijing observed that he could never compare Tanzania to Sierra Leone because the East Africa country has enjoyed one-hundred percent peace and stability since independence. The problems, the Tanzanian journalist continued, ranged from Sierra Leone’s eleven years civil war, Ebola, cholera and mudslides crises. In reality, like Sierra Leone, every country in Africa has its own problems. Sierra Leoneans, who have been described by some as resilient, should keep their dreams alive and fight to alleviate poverty. Is that possible for a country with a population of over seven million and a weak economy? Of course it is, but it requires great desire and commitment from the central government. China, the world’s most populous country, with a population of one billion three million (1.3bn) people, only has 40 million people that are still living in poverty, a situation that has urged the Chinese government to put some measures in place to lift them out of poverty in the next four years. Recently, during the 3rd Forum on China-Africa Local Government Cooperation, Chinese Vice President Wang Qishan said 40 million Chinese are still living in poverty, noting that to reduce that figure the government has committed itself to be lifting at least 10 million people out of poverty every year. Is it possible to lift 10 million people out of poverty within one year? Of course, with the Chinese nothing is impossible. The country has the second largest economy in the world and the Chinese are very patriotic and hardworking. Already, as a way to alleviating poverty, the Chinese government has put plans underway to relocate Chinese citizens living in inhospitable environment. Minister of the State Council Leading Group Office of Poverty Alleviation and Development, Liu Yongfu, at the 3rd Forum on China-Africa Local Government Cooperation, said China has carried massive poverty reduction campaign. “Every year, the sum of one trillion RMB is being invested in country-side poverty reduction and 10 million people in inhospitable environment would soon be relocated. By 2020, China would be able to lift her citizens out of poverty as the Chinese government has increased development in poverty stricken communities,” said the Minister. One trillion Chinese Yuan, popularly called RMB, is equivalent to over one hundred and fifty-seven billion United States Dollars (US$157, 065, 000,000). Indeed, China has put lot of methods in place to alleviate poverty in rural China. One could notice that there have been some amount of poverty alleviation in once poverty-stricken rural communities in China by the implementation of key deliverables to get income. 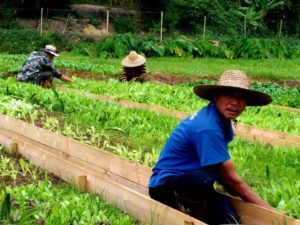 In Zhongliao village, Hainan Province in southernmost part of China, the government, under the astute leadership of President Xi Jinping, has been using agriculture as one of the means to reduce poverty. The village, with about 3,412 inhabitants and 800 households, could now boast of 24-hour electricity supply, improved roads and convenient means of transportation. In this village, villagers were once grappling to make 30,000 to 50,000 Chinese Yuan annually from their farming activities. But Zhongliao’s chairman, Chen Wei, said after several interventions from the government, especially in the area of agriculture, residents of the village could now boast of making at least 120,000 to 150,000 Chinese Yuan annually, which is equivalent over US$23,873. In Gan Za village, a place occupied by both the Li and Miao ethnic minority, also in Hainan Province, has been boosted by tourism as the annual income generation from the many artifacts in its tourist site, grew to 130 million Chinese Yuan, over 20 million United States Dollars and over Le 157 trillion. The National Li and Miao Ethnic Minority Cultural Park, dubbed as the mysterious village hidden in the rainforest, has been ranked as the top ten filming location in China, thereby attracting tourists and film makers. Ji Gui, General Manager of the park in Gan Za village, said the Chinese government invested 500 million Chinese Yuan to set up the touristic park. 500 million RMB is over 78 million United States Dollars and over Le 605 trillion. 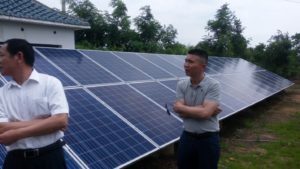 In Lijiawan, a village with 844 residents and 234 households in Hubei Province, manufacturing of solar panels, timber plantation and sewage treatment centre, among other means, have alleviated the once deprived village to a much improved one now. Residents received some money from the Chinese government and have used that money to do wonders in the village. They now produce 60 kilowatts solar energy and sell to the state grid and they are paid 70,000 RMB, over 10,000 United States Dollars, equivalent to Le 84 million, for each supply. Communist Party of China (CPC) Secretary for the village, Zheng Xinping, said they sell one hectare of timber plantation at 60,000 RMB, over Le72 million or US$9,422. He said in 2017, the annual income of the village was 200,000 RMB, over US$31,409 or Le242 million. Through these efforts, the villagers have put aside 1.2 million RMB, which is US$188,457 or one trillion Leones to support the construction of standardised roads linking them and big towns. They also put aside 12 million RMB, approximately US$2 million or Le 14 billion, to construct a beautiful village for all of the households. These initiatives adopted by the Chinese government could be considered by government of Sierra Leone to improve living standards of rural people living in poverty. One would argue that it is impossible to achieve poverty alleviation in a country like Sierra Leone that operates on a very small and weak economy, but the political will is needed to do it and lift people out of poverty.